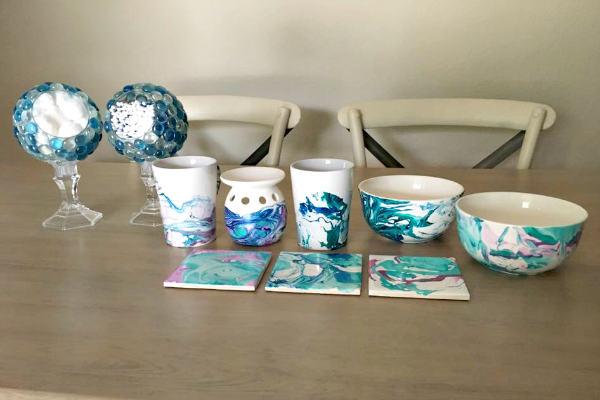 It’s been almost a year since my friend Michelle and I started our monthly craft nights. 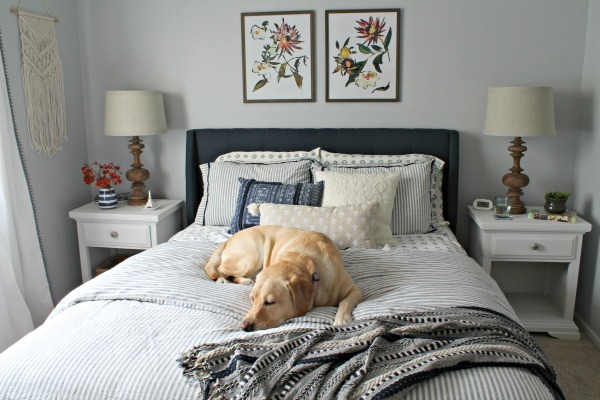 We’ve had so much fun creating the projects that we’ve pinned. 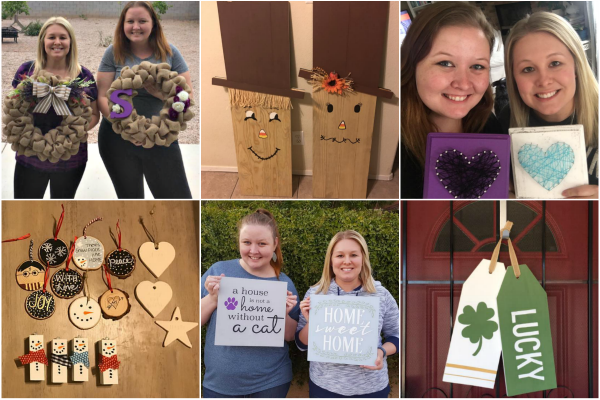 You can see our first three projects here (burlap wreath, reversible scarecrow/snowman signs, and string art) and the next three projects we completed here (ornaments, wood tags, and painted signs). We had our July craft night over the weekend, so today I want to share the last three projects we’ve completed. In March we made patriotic rag wreaths. Michelle had just had back surgery so we picked this craft because it wouldn’t require a lot of moving or bending. Plus the supplies were minimal so I didn’t have to drag a bunch of stuff to her house for us to work on them. They took FOR-EV-ER to complete (we had to meet a second day to finish), but I’m so happy with how they turned out. 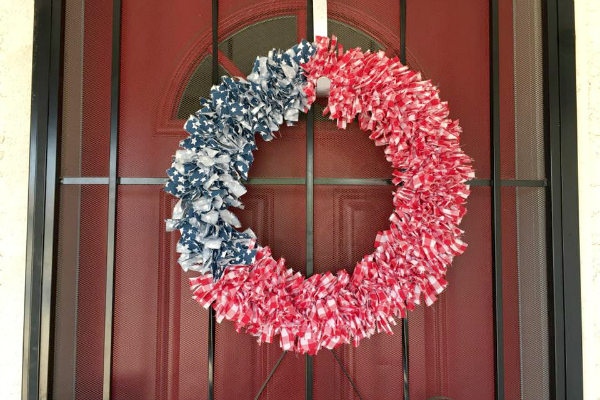 I hung mine on our front door around Memorial Day and just recently took it down after the 4th. We used this tutorial from Vintage, Paint, and More as a guide for “cutting” and tying the fabric. 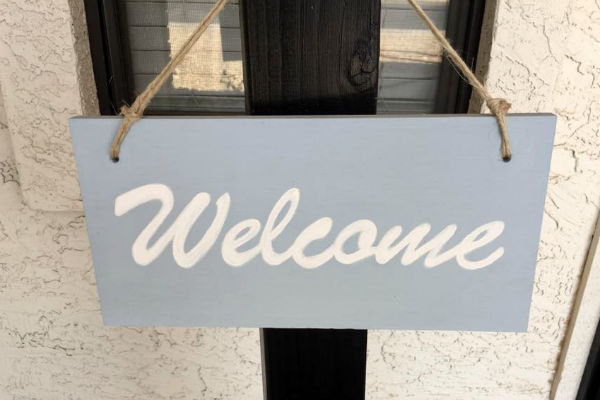 We were both busy in April, so we had to skip that month, but in May we made these outdoor wooden sign posts and welcome signs. They turned out so cute and this is definitely one of my favorite projects so far. 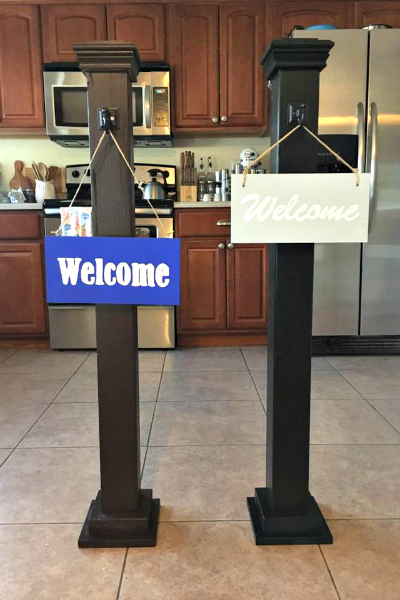 We mostly followed the directions from this post from Shanty 2 Chic except that we bought these fence post caps from Amazon for the tops instead of the wood pieces. We also screwed our bottom pieces together instead of just using wood glue. It was so fun to see what we both came up with. 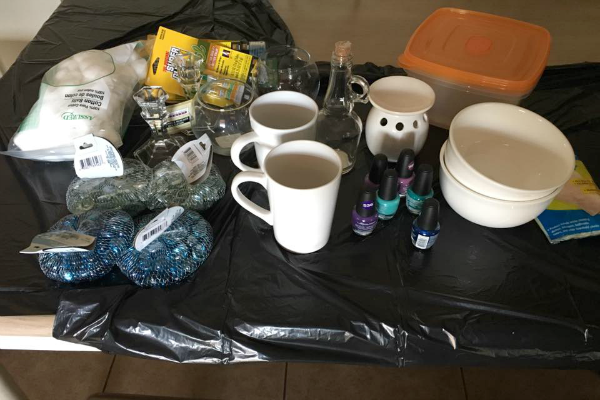 I marbled items using nail polish and Michelle made cotton ball/q-tip holders out of candle holders and glass stones. 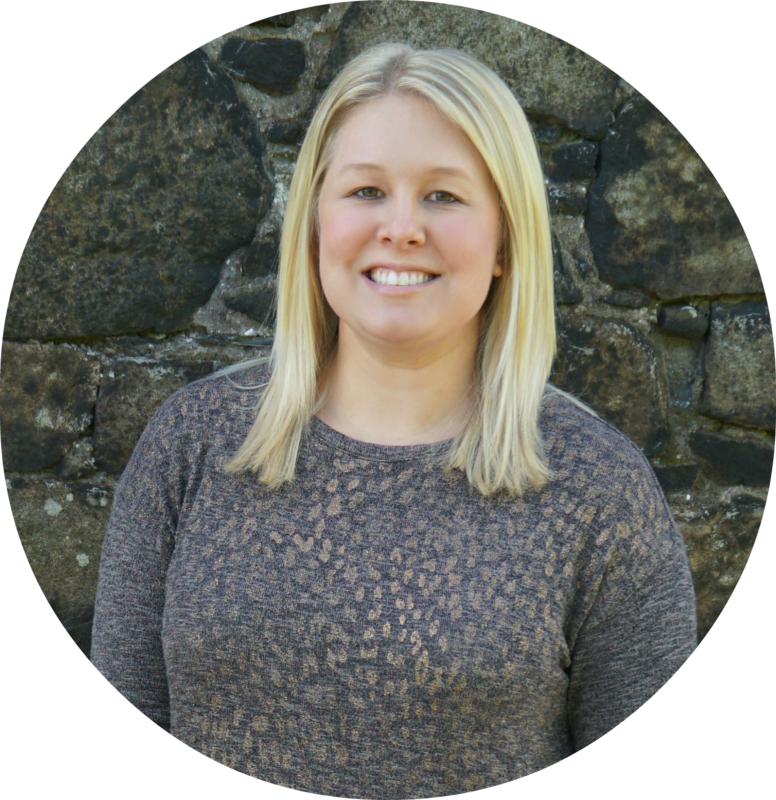 I love both projects and I love that we tried something new and pushed ourselves out of our comfort zone a bit. The white tiles weren't from the Dollar Tree, but I got kinda carried away with this project and was looking for more items to play with. I’m so happy that we started craft night! I love crafting and creating, but need a push like this to actually go buy the supplies and sit down and make. We haven’t decided what we are going to make for our August craft night yet. Do you have any suggestions for us? Those marbled ceramics are beautiful! Love that you guys use your crafts as an excuse to get together for girls' nights! Love these marbled pieces! Im totally obsessed with DIY marbling right now and I love seeing it all over Pinterest! 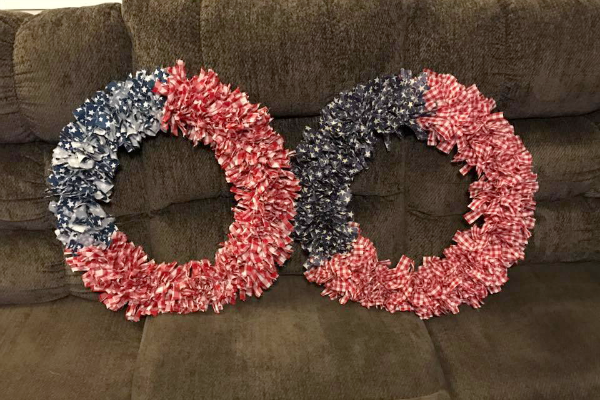 I absolutely adore those 4th of July wreaths!! I'll have to make one for next year! You are two talented friends. Love what you do to mundane stuff. And those wreaths are fabulous ! I love those marbled ceramics. I also do DIY projects but maybe because I do not have a partner to do it with I always lose inspiration and leave it that way. Wow, you inspired me so much with those marbled bowls (the greenish-blueish one is a real peace of art)! I can't wait to try this DIY! So cute! Love all of your projects! I love that you get together and do these projects. So much more motivation to get them done when you are doing them with someone.